I've been spending a lot of time trying to make my Skyrim even better. It's a pastime from which I derive almost as much pleasure as playing the game. I've installed mods to make the sound effects of thunder better and completely overhaul of the inventory UI, that's child's play. But I've also spent time editing my Skyrim.ini file to tweak the display so shadows don't just flicker all over the place. And that's what I wanted to talk about before I listed some of the mods I tried this week. Fair warning: I'm going to get into some technical stuff here, so if you want to skip ahead to the cool new mods feel free to do so ... now. Basically, the Skyrim.ini file in your game folder (\My Documents\My Games\Skyrim if you used the default install settings) is a massive set of variables that determine how the engine displays the graphics. Some of the variables are easy to understand like "fAudioMasterVolume" which adjusts the maximum volume of sound output by the game while others are a little more arcane like "iBlurDeferredShadowMask" (more on that in a bit). By changing the values in the file in a simple text editor and saving them, you can alter the way your game plays and looks. Note that some variables that the Skyrim.ini file can read don't appear in the file by default, but you can adjust the settings if you add them in. Also, some of the variables have weird restrictions like odd numbers only or a limit to how high or low you can set them. For example, uGridsToLoad will change the area the game draws the most detailed graphics around your character. This must have an odd number for a value (don't ask me why) with 11 resulting in detailed and awesome looking scenery yards away. The tradeoff, of course, is performance as the higher detailed graphic will slow down a middling to low end graphics card. Proceed with caution. The file is read when you boot up the game and load the engine for the first time. Feel free to experiment with the values, even if you screw up the file and the realm of Skyrim looks like it might have been sprayed out of an aerosol can, there is a solution. Just delete the file and the game will create a new one with default settings. But it's probably a good idea to back it up before fiddling too much, just in case. While there are tons of things you can do with the Skyrim.ini file, I'm going to concentrate on fixing one part of the game that really annoyed me. The shadows in the default settings were just terrible, always flickering and appearing blocky and pixilated like sunlight magically transformed into 8 bit Atari graphics whenever it hit Lydia's face. Any immersion I mustered in Skyrim was destroyed when I noticed the flickering shadow pixels, so I decided to see what I could do to fix it. iShadowMapResolution=8192 - If your graphics are set to Ultra, this value will be 4096 but raising it will improve the resolution of shadows so they appear less blocky. You can change this to any value that is a multiple of 8, but 8192 is the highest it will go. Unfortunately, the edges of shadows will still look a little rough, but it's a hell of a lot better than how they looked before. iBlurDeferredShadowMask=7 - This variable basically blurs the edges of shadows so that the blockiness is less apparent. Combined with a higher iShadowMapResolution, this will make your shadows look palatable. But what about the weird shifty shadows that seem to always occur in broad daylight? fSunUpdateThreshold=0.100 - Adding this setting with a value of zero will essentially decrease the delay between updates to the shadows of the game to nil. fSunShadowUpdateTime=0.000 - This setting controls the time of the transition between one shadow update to the next and it is responsible for the weird strobing and flickering effect. Add it to your Skyrim.ini file with a value of zero and transition happens instantly. While it doesn't prevent some strange shadow movement when NPCs move their face in the daylight, the updates essentially occur in real time so it looks a bit better. 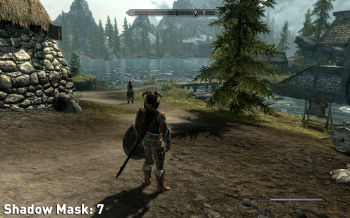 By changing and adding the above variables, I was able to get Skyrim's shadows to make a lot more sense in how they were displayed, at least for me. I have a decent gaming computer (2ghz Dual Core duo CPU, nVidia Gforce 285 and 4 gigs of RAM) and, after messing with these variables, I didn't experience and stuttering or slowdown from altering my Skyrim.ini file. Your personal mileage may vary and you may have to sacrifice looks for performance, especially when it comes to displaying higher resolutions. 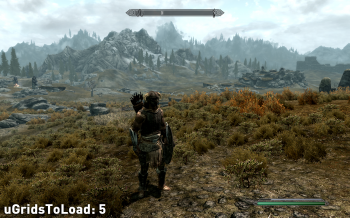 There are tons of other ways Skyrim.ini can be used to finely tune your gaming experience from altering the way the in-game map is displayed or controlled to disabling blood and gore. Nvidia has a great guide to tweaking your Skyrim which you can check out if you're interested in learning more, and there are tons of helpful hints/pitfalls on the official Bethesda forums and other places on the web. Happy tweaking! Now on to the mods!